I have a thing about bridges: I’m in awe of them when they are well-designed, inventive and delightful examples of architecture, with a flair or presence that leaves an impression long after I’ve driven or walked over. But not when they are remnants of shoddy construction gone awry, crumbling under the weight of rain, overuse and lack of maintenance. Just waiting to collapse. 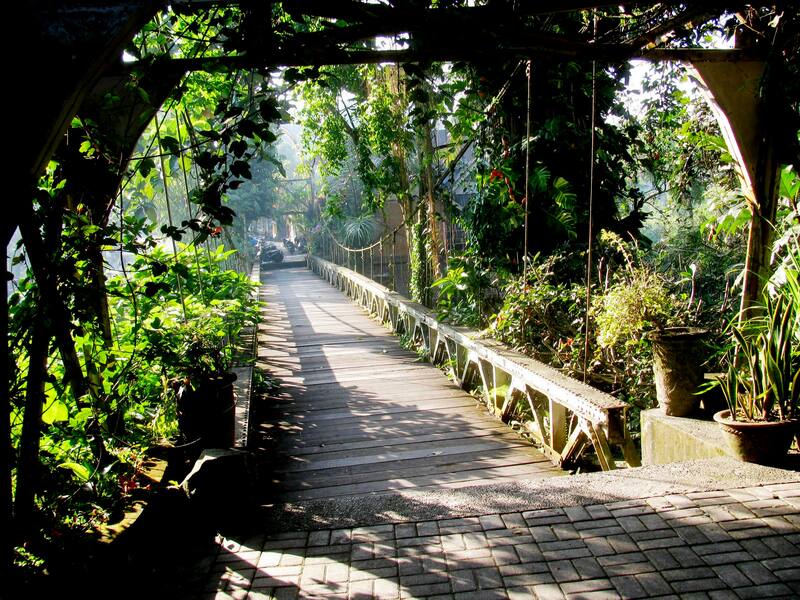 The iconic and once-picturesque Campuhan suspension bridge, built by the Dutch in the early 20th century, lies in a valley at the confluence of the Ayung and Wos rivers, amidst an old-growth jungle at the western edge of Ubud. 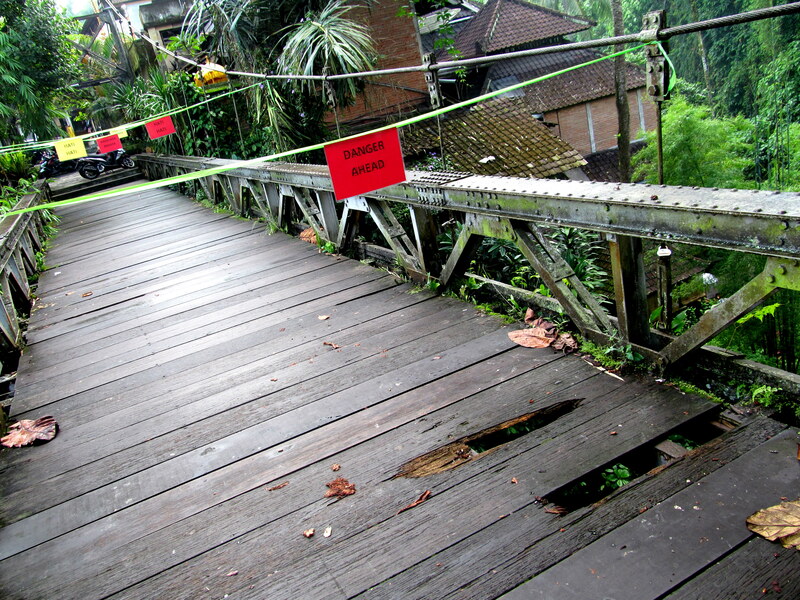 This footbridge, onc e used by vehicles as well, sits alongside a newer bridge for vehicular traffic. The drop down from both bridges is probably close to 30 meters – considerably higher than the 10 meters I tumbled down in Battambang. A ten meter fall is somehow survivable (just barely); I’ll bet that thirty meters is not. 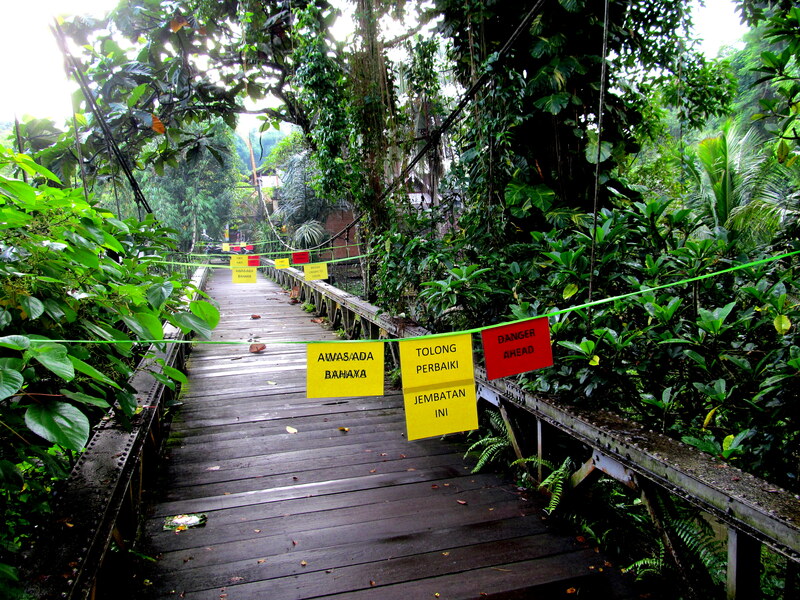 I spent the past week printing up and laminating signs that read: Danger, Bridge Unsafe to Cross, Hati Hati (careful) and Tolong Perbaiki Jembatan Ini (please repair this bridge). I bought a large bag of plastic/raffia rope. And this morning, with my activist friend R along, we hung the signs all across the bridge. Then I took photographs and texted some of my friends with the news, asking them to drive by. That’s fantastic!! In addition to saving lives and prompting the authorities to action, I hope a photo of your activism will hang in an art gallery. Thanks for that Linda.. didn’t know you’ve been checking out my blog, but welcome and good to hear from you! Good initiative on your part! This historic bridge needs saving and it’s wonderful that you are taking the lead. Thanks Malou! 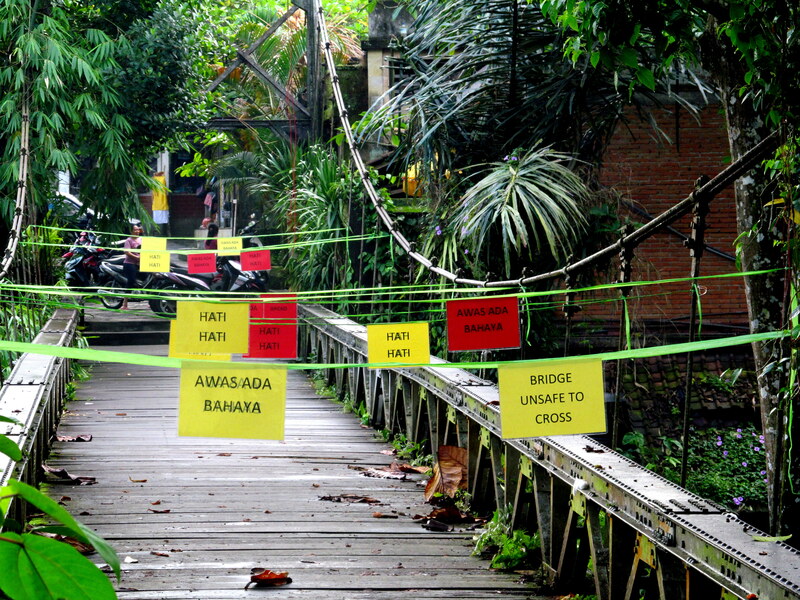 It’s a tall order and the signs have already been taken down (sheesh, welcome to bali), but I’m trying to find a strategy that will work – and won’t alienate photographers and the government.